Our Resort Ranger team from Kingfisher Bay chat about all things wild and wonderful in the animal kingdom on the world's largest sand island - Fraser Island. December and January is a super busy time on Fraser Island – not only do we have Christmas and New Year’s celebrations to get through, but we also have an influx of guests to the island and to the resorts. This increased human activity sometimes makes the wildlife a little hard to spot but, what can we say, we thrive on a challenge. Our visitors of the feathered variety certainly haven’t disappointed either this month and whilst we haven’t seen huge numbers of adult birds on our daily walks, there’s been many cute baby fledglings taking to the skies above Fraser. 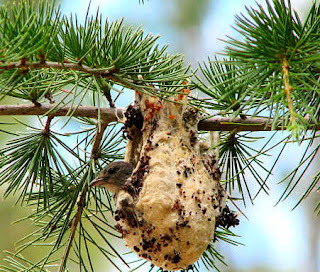 (A fledge is best described as a stage in a young chick’s life where the feathers and wing muscles are sufficiently developed for flight – a young bird that has recently fledged, but is still dependent on its parents is called a fledgling). Our chicks certainly aren’t shy and we’ve had many flap their way into the resort’s Centre Complex for a look around. One such unexpected feathered visitor was an adorable baby male Red-backed Fairy Wren (Malurus melanocephalus), that was found sitting on the floor near our pool area outside, looking very cute with the bright red patch on its back. The bright patch on its upper back clearly identified it was male. These birds use their bright plumage to attract a mate - the brighter the colour, the more attractive they are. One of our eagle-eyed young guests also found a baby Mistletoe Bird (Dicaeum hirundinaceum - pictured) in its own little nest and brought it to Ranger Kelly for some TLC. As we don’t interfere with the Fraser wildlife, Ranger Kelly took it outside and gently placed the baby bird and its nest in a tree. When we went by the next day, the nest was there, but our fledgling was off exploring Fraser’s gorgeous western side. 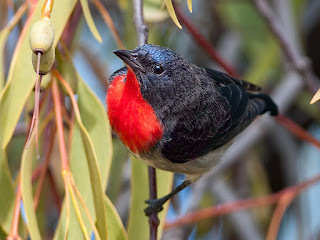 The small Mistletoe Bird is also known as the Australian Flowerpecker and is easily identified in the underbrush by its vibrant red throat set against a white belly and glossy blue-black head, wings and upper body. A Mangrove Honeyeater in full glory! 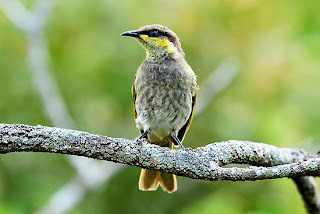 We’ve also spotted plenty of Honeyeaters (this name refers to a diverse range of Australian birds that belong to the family Meliphagidae and are characterised by their brush-lipped tongue which allows them to take nectar from flowers) and Grey Shrike Thrushes (Colluricincla harmonica) in and around the Wallum. The Grey Shrike-Thrush is one of the best loved and most distinctive songbirds of Australasia. And for our keen birders, we were lucky enough to spot one of our fabulous songbirds, the Mangrove Honeyeater (Lichenostomu fasciopgularis - pictured above), on our guided canoe paddle to Dundonga Creek, about a kilometre north of Kingfisher Bay Resort. Mangrove Honeyeaters are also called Varied Honeyeaters and are common around the bay area although we don’t often see them on Fraser Island. Look forward to blogging next month and here’s cheers to a Happy New Year from our entire Ranger team! World Heritage-listed Fraser Island is a rare and beautiful holiday destination, at the start of the Great Barrier Reef, offering a refreshing change from the hustle of mainland Australia and the resort islands of Queensland’s north. The island’s untamed wilderness and rugged, natural charm entices from the first, providing 4WD adventure and excitement, but also a relaxing atmosphere from your base at beautiful, eco-friendly Kingfisher Bay Resort. Follow Kingfisher Bay Resort Group's board Kingfisher Bay Resort (Fraser Island) on Pinterest.